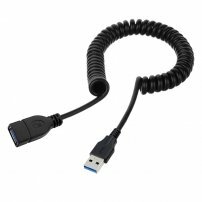 3.3ft / 1m Long Coiled Retractable USB 3.0 Type-A Male to Female for Cell Phone Charging / Data Sync : allputer.com - Accessories for all your Portable Electronics & Computers! Retractable cables, also known as retractable cords, coiled cables, curly cables or spiral cables are a highly durable and flexible cable solution where extension and retraction of a cable is required for example inside a telescopic mast. We bring these features to the USB cables with the super fast speed of USB-C 3.1 and USB 3.0 for your phone life. - This is a coiled USB 3.0 to USB 3.0 Plug to Jack cable. It is with HIGH SPEED charging and HIGH SPEED data SYNC too. - May serve as a protector to the USB Type-A Socket on your device side. - Length: Min. : 1.6 feet (or 50cm) approx. - Length: Max. : 3.3 feet (or 100 cm) approx.